One of my neighbors came to the USA from an Asian country spelled with five letters beginning with “I”. After he moved in, some strange plants that I had not seen in our part of the world began to grow. Perhaps he got then at Exotic Plants R Us, but I doubt it. Maybe you have had the same experience. Apparently the same thing happened to ancient Israel. Typical plants known to the Biblical Israelites include wheat, barley, grapes, olives, pomegranate, date, and fig. Sign in the Ashkelon National Park indicating one of the groups that inhabited the city. Photo by Ferrell Jenkins. 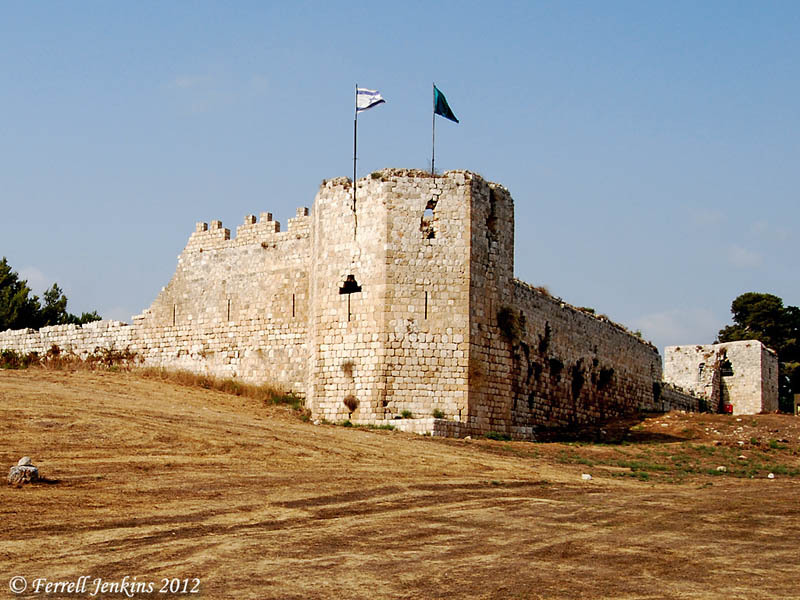 What happened when the Philistines moved in? A recent article by Frumin, Maeir, Horwitz, and Weiss in Scientific Reports provides an answer. The authors describe their approach. Here we propose a novel research approach aiming to study the different anthropogenic impacts on an ecosystem resulting from the advent of an extinct historical culture, the Philistines–one of the so-called “Sea Peoples”–that appeared in the southern Levantine littoral, after ca. 1,200 BCE. Until quite recently, the accepted view was that the Philistines originated from a single region, most likely somewhere in the Aegean. 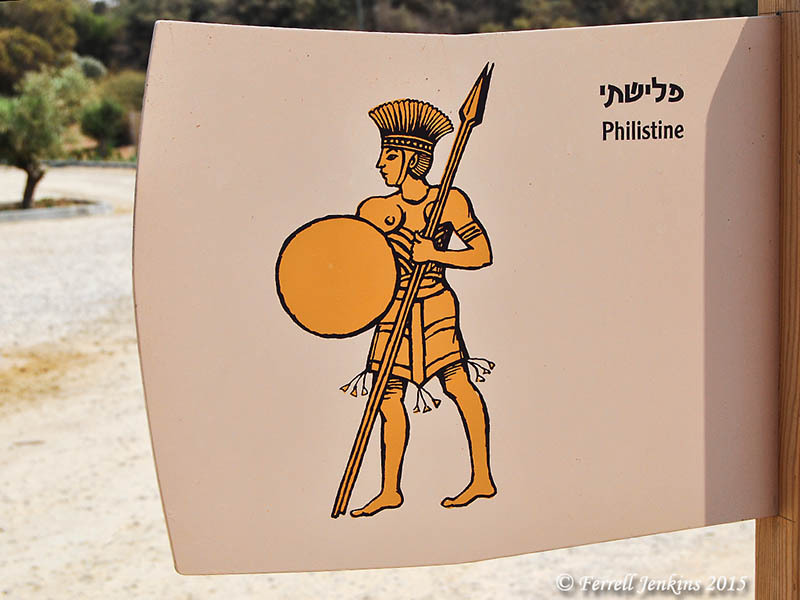 Recent research has revised this view and shown that in fact, the Philistine culture is comprised of migrants of multiple foreign origins, including the Aegean, who, when arriving in Canaan, intermingled with local Canaanites. The non-Levantine origin of a substantial portion of the Philistine culture is evidenced by their distinctive architecture, ceramic ware, technologies and ritual activities that point to their diverse and multifaceted origins with different components resembling Aegean, Cypriot, Anatolian, Egyptian and even Southeast European cultures. 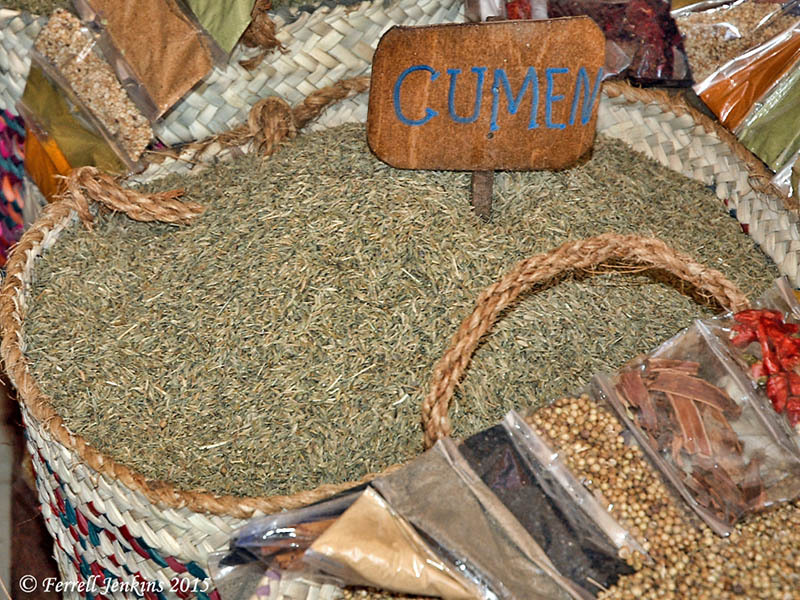 Cumin (Cuminum cyminum), found at Aphek in the early Iron Age. 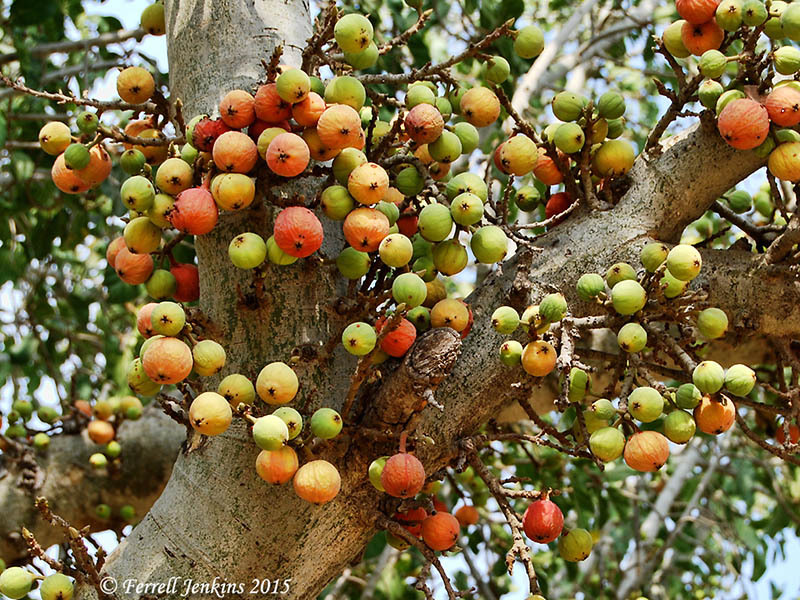 Sycamore (Ficus sycomorus) found at Ashkelon in the late Iron Age. Opium poppy (Papaver somniferum) found at Ashkelon in the late Iron Age. Cumin and sycamore came from the Eastern Mediterranean, but opium came from west Europe. Let’s take a look at a few Biblical references to cumin and sycamore. Cumin is mentioned by the prophet Isaiah in the 8th century B.C. (28:25, 27), and then by Jesus in the first century A.D.
Cummin for sale at Aswan, Egypt. Photo by Ferrell Jenkins. The sycamore is mentioned in connection with Solomon who wanted to make cedars as plentiful in Jerusalem as the sycamores were in the Shephelah. Amos of Tekoah claimed to be one who took care of the sycamore fig trees. And there is the well known story of Zacchaeus who climbed up into a sycamore tree at Jericho in order to see Jesus as He passed by. Sycamore figs at Ashkelon. Photo by Ferrell Jenkins. 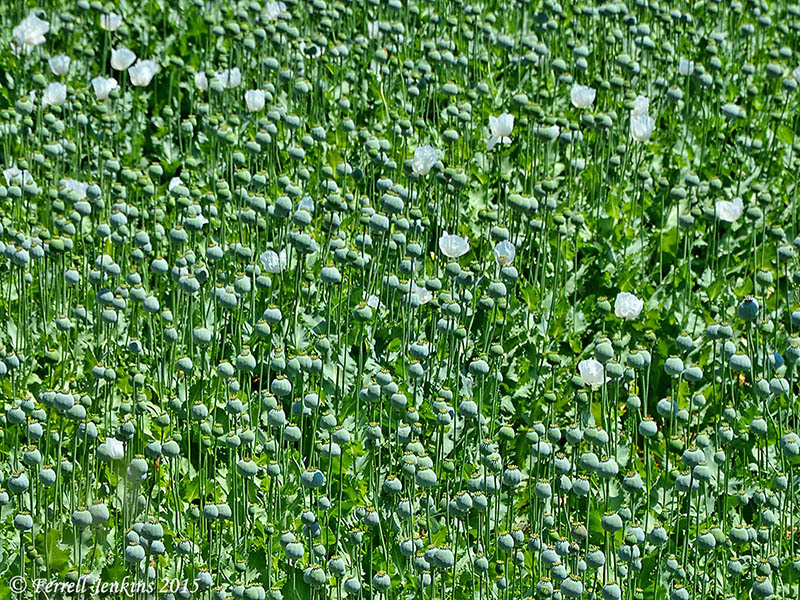 The opium poppy is not mentioned in the Bible and is not currently grown in Israel. Turkey is one of three countries where it is grown for medicinal purposes . I have seen small fields of it in several places in Turkey. 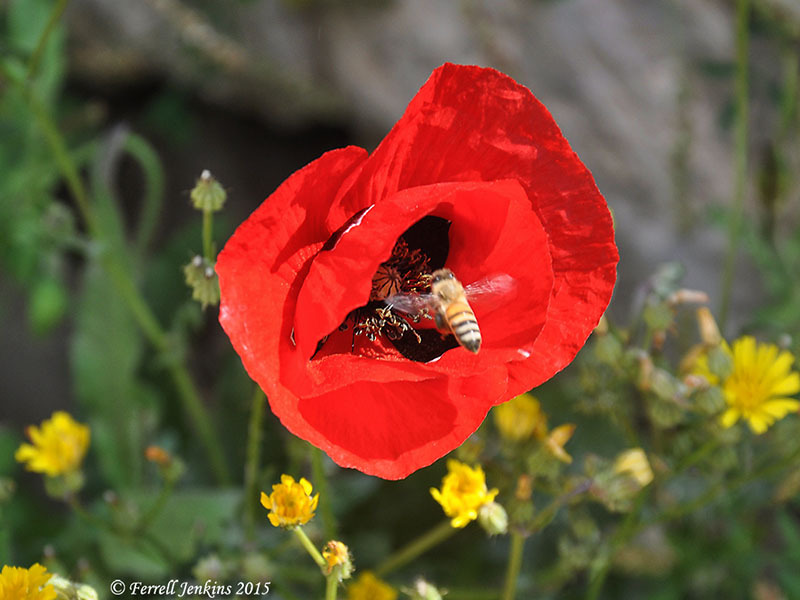 Opium poppies are grown for medicinal purposes in Turkey. Photo by Ferrell Jenkins. The link to the full article by Frumin, Maeir, et al. is here. Near the top there is a link to the PDF file. An informative article by Nir Hasson appeared in Haaretz here earlier this week. Archaeology does not consist solely of stone walls and broken pottery. It also includes uncovering and identifying the tiniest of seed. 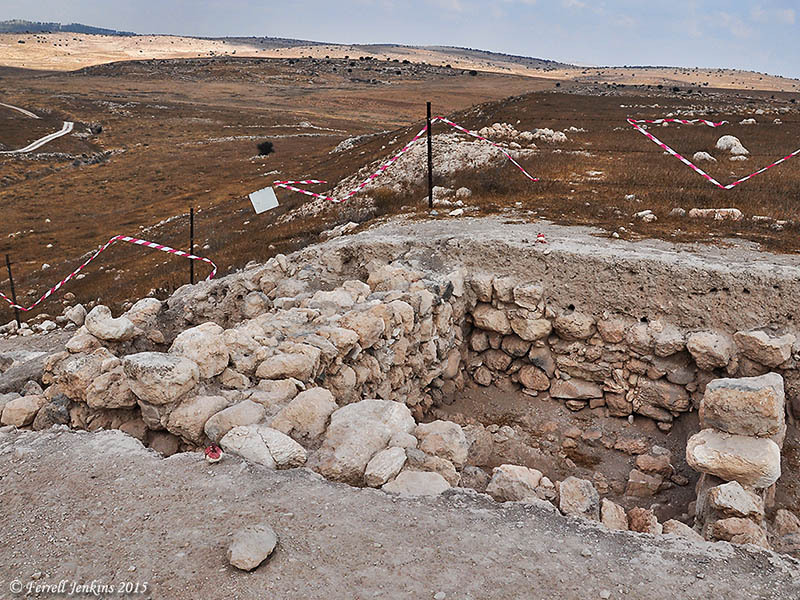 HT: Thanks to Aren Maeir, director of the excavation at Gath for the original article. Check out his blog. TTel Halif is located between Hebron and Beersheba in the Negev (Negeb, Negev region, South land or South country). Tel Halif (= Arabic, Tell el-Khuweifeh). 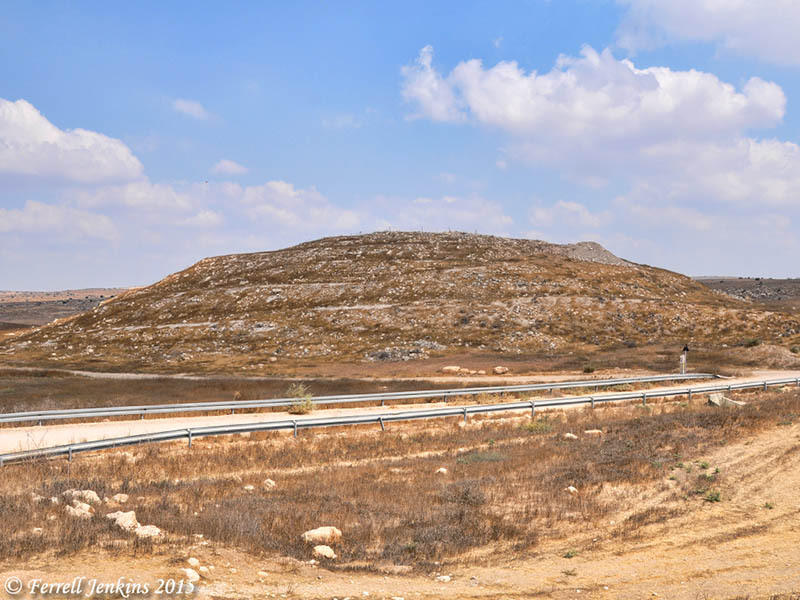 In an article about the Biblical identity of Tel Halif, Oded Borowski points out that this was territory allotted “to the tribe of Simeon (Joshua 19:1-9) and later to the tribe of Judah (Joshua 15:20-32).” He discusses various efforts to equate the site with a site named in the Bible. Borowski narrows his discussion to four main candidates: Sharuhen, Hormah, Ziklag, and Rimmon. He think Rimmon (= En-Rimmon) is the correct choice (Biblical Archaeology Review, Vol. 51, Issue 1). Rimmon is mentioned five times in the Bible (Joshua 19:7; 1 Chronicles 4:32; Joshua 15:32; Nehemiah 11:29; Zechariah 14:10). I am not in a position to venture even a guess. The photo below shows the terrain near Tel Halif, north of Beersheba. 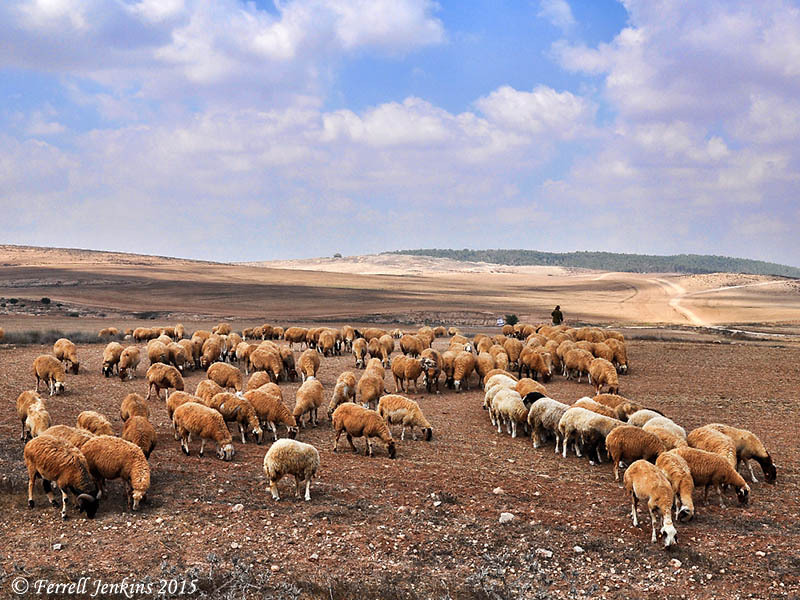 Sheep in the Negev near Tel Halif. Photo by Ferrell Jenkins. The Israel Antiquities Authority announced today the discovery of artifacts excavated from a cave near Tel Halif, in the region of Kibbutz Lahav, in the south of Israel. 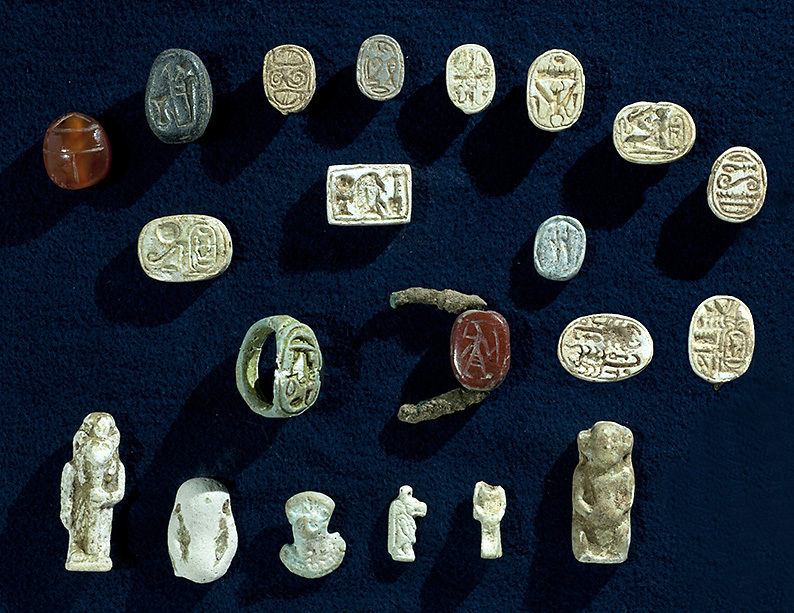 Other artifacts discovered included seal rings made of faience and a wealth of figurines and amulets in the image of gods sacred to the Egyptian culture. A collection of artifacts with characteristics of the Egyptian culture, which were discovered in the excavation. Photographic credit: Clara Amit, courtesy of the Israel Antiquities Authority. Items dating as late as the Iron Age were also found during the excavation conducted by the Unit for the Prevention of Antiquities Robbery of the IAA. The excavation followed the discovery that the cave had been plundered. 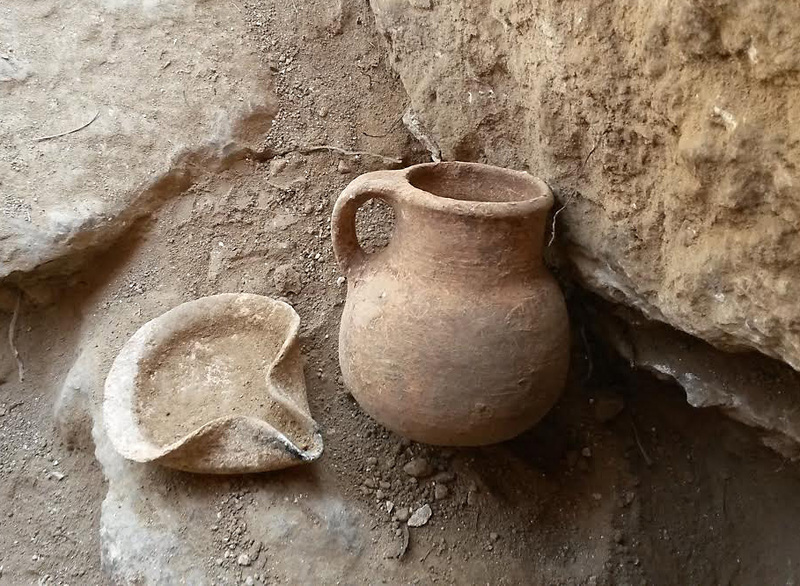 An oil lamp and a ceramic jar that date to the Iron Age, which were discovered in the cave. Photographic credit: the Unit for the Prevention of Antiquities Robbery of the Israel Antiquities Authority. The Biblical record indicates Egyptian influence in Israel as late as the Iron Age. The prophet Isaiah warned about reliance on Egypt in the 8th century B.C. (Isaiah 30:1-5). Tel ‘Eton (also Tel Eiton and Tel Aitun) is not the easiest archaeological site to locate. 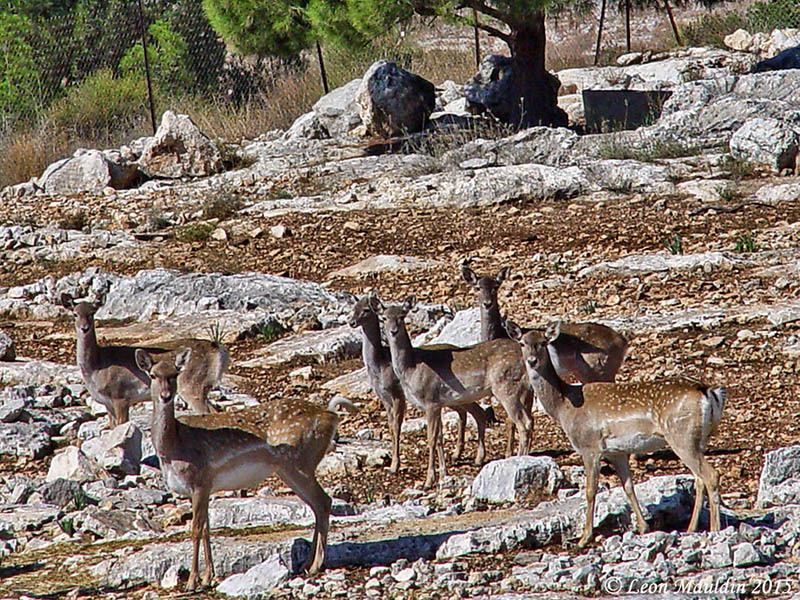 The site is situated on Israel’s border with the Palestinian West Bank. Palestine is on the east side of the mound and a military firing range is on the west side. When Leon Mauldin and I located the place we decided it would be best to stick to the gravel road without straying too far to the left or the right — sort of like Joshua. Tel ‘Eton currently is equated with biblical Eglon by many scholars. Recent excavations have been conducted under the direction of Prof. Avi Faust of Bar Ilan University. Here is a photo of the tel from the south and perhaps a little to the east. Tel ‘Eton (Tel Eiton; Tel Aitun) from the south (and east). Photo by Ferrell Jenkins. Eglon is mentioned at least eight times in the Bible, all in the book of Joshua (10:3, 5, 23, 34, 36, 37; 12:12). The Scripture emphasizes that Israel defeated the king of Eglon. Notice the relationship between Lachish and Eglon. The distance from Lachish to Eglon (on a straight line) is 7 miles. From Eglon to Hebron is 10½ miles. An archaeological team has uncovered remains of what may have been an administrative center during the period when Judahite kings ruled out of ancient Jerusalem. Led by project director Avraham Faust, an archaeologist with Bar-Ilan University near Tel Aviv, Israel, excavations at the site of Tel ‘Eton located on the edge of the fertile Shephelah and the Hebron hill country to its east have revealed structures, artifacts, and fortifications that tell of an ancient city that historically straddled the eastern edge of the lowlands between the biblical kingdom of Judah and Jerusalem in the east and the cities of the Philistines on the Mediterranean coastal plains of the west. Among the finds was a large, 240 sq.m. 8th century BCE house structure built following a four-room plan typical of ancient Israelite dwellings, featuring high-quality construction and, with its location at the highest point on the mound, commanding a strategic view of all areas below. The ancient building, along with its town context, was strategically located at the cross-roads of important north-south and east-west routes, set above fertile agricultural country. But the most abundant finds for the early periods were dated to the Late Bronze Age (ca. 1550-1200/1150 BCE). That is the period of Joshua. Here is a portion of the excavation from 2011. Tel Eton excavation in 2011. Photo by Ferrell Jenkins. 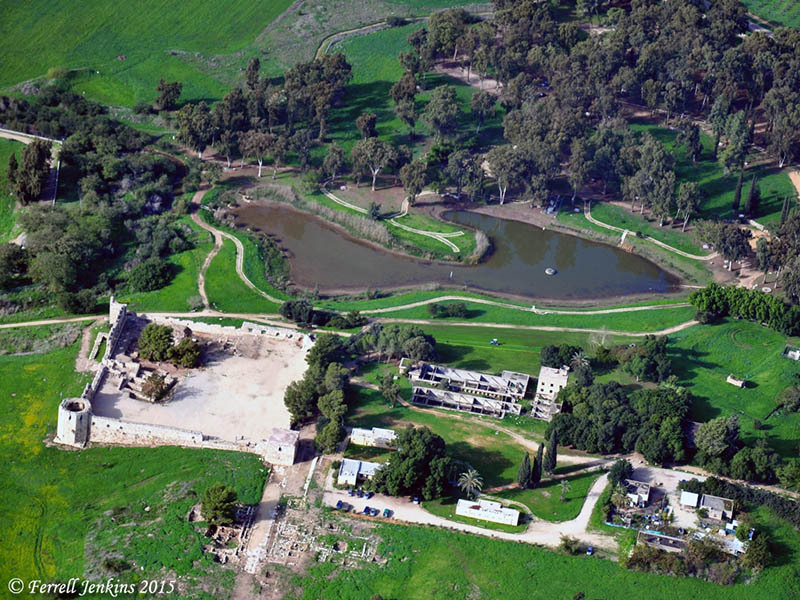 The Tel ‘Eton Excavations website contains many small photos, plans, history, bibliography, etc. Almost four years ago I wrote a post about the strong East winds of the Middle East, also calling attention to the winds from the south. Several bloggers have called attention to a recent occurrence of the winds affecting Egypt, Palestine, and Israel in particular. I thought it would be appropriate to reprint some of that earlier material here with an update. Almost everyone who has visited Israel has learned of the West winds that make their way through the depressions around the Sea of Galilee and create storms on the Sea. Unless you travel in the “transitional season” or in the (dry) summer season you may not have learned about the East wind. This wind is called the sirocco. In Egypt it is known as the khamsin, and in Israel as the sharav. It is this intense dryness and the fine dust in the air which are so exhausting, for other hot days, though troublesome, do not have the same effect. People with a heart condition, nervous complaints, or sinus trouble are particularly affected, but even the mildest-tempered person is apt to become irritable and to snap at other people for no apparent reason. Tourists find the sirocco especially frustrating, for not only does travel become fatiguing, but the fine yellowish dust which fills the air drains it of all color, blots out all but the immediate vicinity, and makes photography a mockery. Here is how Larry Haverstock described his day walking the Jesus Trail in an Email to me. No blog last night because of the storm. I woke to high winds from the east which dusted up the air so badly that photos were mostly useless. Worst part was that it was directly against me and really HOT. Pushing against 20+ mph winds really took the steam out of me. By the end of the day I was utterly exhausted. Drank my full 3 litres and had good dinners and breakfasts, but energy levels are still very low. The photo below is one of the aerial shots Larry and I made a week earlier. It was made while flying over the west shore of the Sea of Galilee, with the view to the west. You can see Mount Arbel and the Wadi Hamam below. The Via Maris runs in this valley which is also called the Valley of the Doves. You will notice two lines of mountains further west. I am rather sure that this is the route Larry was walking. Larry lived in Washington state for many years. I think he is not bothered by the sudden rains, but the intense heat and strong wind from the east may be another matter. I want you to think about the fact that all of the biblical characters from the Patriarchs to Jesus and His disciples encountered conditions similar to these (and worse). 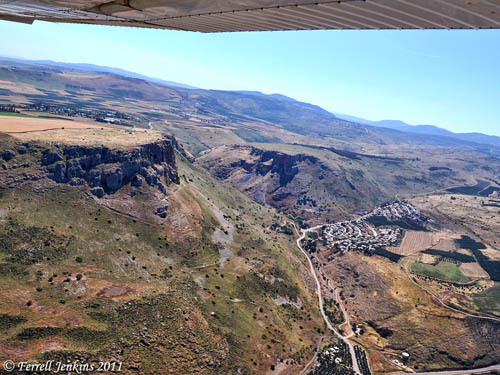 Aerial view of Arbel, Wadi Hamam, and the Via Maris. Photo by Ferrell Jenkins. Notice Elihu’s comments to Job about the south wind. Do you remember Jonah’s problems after enjoying the shade of his plant? Baly calls attention to the effect of the spring siroccos on the crops. The spring siroccos destroy the winter grass and may damage the crops if they come too soon, and hence they appear constantly in the Bible as a symbol of the impermanence of riches or of human life. Note these additional references in your own study: Psalm 103:16; Isaiah 40:6-8; Hosea 13:15; Ezekiel 17:10; James 1:11. In a recent post Barry Britnell (Exploring Bible Lands) add Deuteronomy 28:15-24 here. It was while making this first effort of the morning that I encountered my nemesis for the rest of the day. It was only 10 o’clock but already a hot wind was blowing in my face. What I couldn’t know at that moment was that as I climbed the western slope the mountain was acting as a shield so that I wouldn’t feel the brunt of this wind until I summited. As soon as I stepped out upon the actual heights of Arbel I knew I was in for an unusual day. The view was phenomenal and despite the dust in the air I got the following shot of the Plain of Gennesaret. This is the Northwest corner of the Sea. Just out of sight on the waterfront to the right are the ruins of ancient Magdala from whence one very famous Mary came. All the rest of the shoreline is the area in which Jesus spent a tremendous amount of time, preached some of His very most famous sermons, worked many miracles, and made His home in Capernaum which is along the shore as it turns the corner and heads off to the right in the distance. Much food for thought when you stand in this place. Unfortunately, the wind was howling and dangerous here. I don’t have a weather report, but guess it was in the vicinity of 40 miles an hour since I was actually being pushed off balance and forced to take a step now and then to keep from falling over. It did give me pause, but I was determined to take the shorter, harder, steeper trail down, so I spent about 20 minutes re-rigging my equipment. Fearing the monopod “sword” might jam itself on the rocks somehow I removed it from the under arm position and strapped it vertically to the back of the pack. Then, using the extra leather chin strap rope I’d brought along for emergency, I took off my hat and lashed it on the back of the pack too. This hat had a very wide and stiff brim which had helped shield my face from the gale on the way up, but was now a liability, capable of catching the wind and pulling me off balance, so I stowed it. Then I took the pack’s belly straps and lengthened them so that rather than directly clutching my stomach, they came out and over the front pack so that I could tightly restrain it from swinging. Having thus reduced my exposure to the wind I started down. 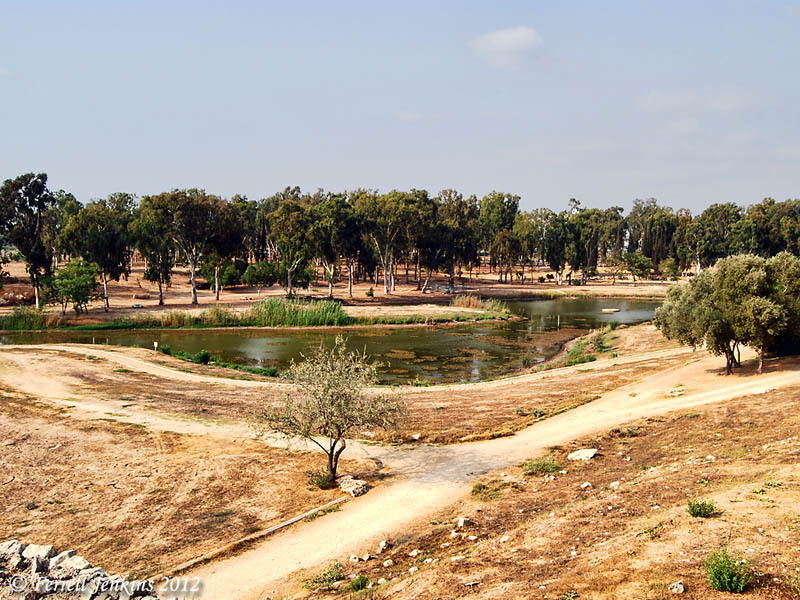 Shortly afterwards I called attention to the comparative photos that Dr. Carl G. Rasmussen has included in his Zondervan Atlas of the Bible, and on his Holy Land Photos website here. These photos provide a vivid contrast that the dust storms make. In today’s Weekend Roundup at Bible Places Blog, Todd Bolen calls attention to the current article in The Jerusalem Post here, and the 25 or so outstanding large photos from Egypt, Palestine, and Israel in London’s Daily Mail here. Be sure to look at these photos. I have experienced a delayed flight in Egypt due to the sand storms, and the scorching hot wind with dust in Israel, but nothing like these photos reveal. In the previous post I mentioned that several former students and friends are participating in the dig at Tel Lachish this year. Six years ago on this day I wrote about Lachish on July 4th, 1980. Since we have many more readers now I think it appropriate to re-post that entry here. On July 4, 1980, I was participating in the excavation at Tel Lachish in Israel along with three of my colleagues from Florida College (James Hodges, Phil Roberts, and Harold Tabor). There were sizable numbers of participants from Israel, United States, Australia, South Africa, and Germany. In addition to the hard work out in the sun, we had some fun. On the morning of July 4th a few of the guys got an American flag and put together a drum and bugle corp and marched across the tel. Note especially the plastic bucket being used as a drum in this photo. Lachish is identified with Tell ed-Duweir, located in the shephelah (lowlands) of Judah about 30 miles south west of Jerusalem. It is mentioned in Scripture during the period of the conquest (Joshua 10, 12, 15). Lachish served as one of the Judean store cities during the period of the kingdom Judah. Many of the LMLK jar handles have been found here. The city fell both to the Assyrians and the Babylonians. Excavations were carried out by the British between 1932 and 1938 under the direction of J. L. Starkey. Starkey was murdered in 1938 while en route to the opening of the Palestine Archaeological Museum (later the Rockefeller Museum) in Jerusalem. Professor Yohanan Aharoni of Tel Aviv University excavated the “Solar Shrine” in 1966 and 1968. A new excavation was begun in 1973 under the auspices of The Institute of Archaeology of Tel Aviv University and The Israel Exploration Society. Dr. David Ussishkin served as the director until 1994. 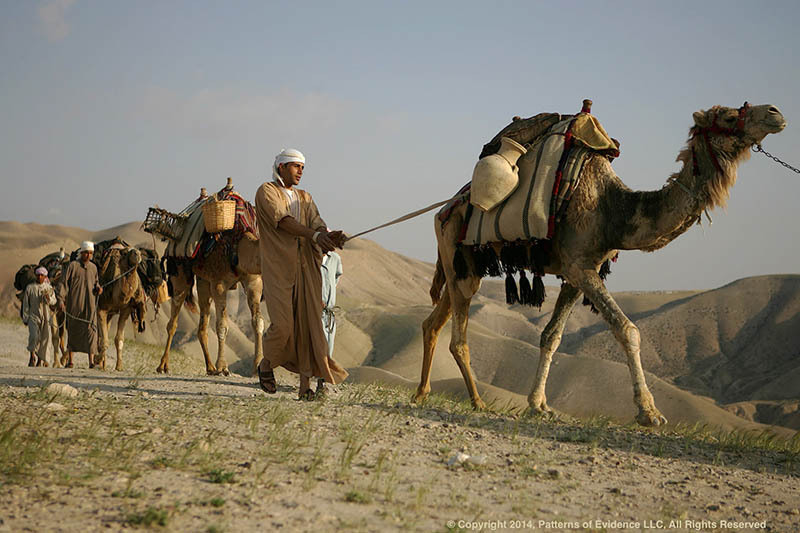 One afternoon while we were in our tented camp a short distance from the tel, a bus load of Arabs from Jordan arrived. They had once lived in the area, prior to the founding of the State of Israel. Some of the older men had worked with Starkey. This photo which I took shows four of the Arab men and three of the Israeli archaeologists, along with one American. See if you recognize Gabriel Barkay, Richard Whitaker, Adam Zertal, and David Ussishkin. The Arab men enjoyed seeing the old photos from the Starkey excavations and pointing out themselves as much younger men. I think you will see Ussishkin’s head to the left of the Arab, and Barkay on the right. Update (July 6, 2008). Todd Bolen, at BiblePlaces.com has commented on this blog under the title Reminiscences of Lachish. He says he heard Gabriel Barkay tell about this event, but he includes some additional information that I did not know, including the name of the village where the Arabs previously lived. The town of Qubeibe was leveled by the Israeli military in the 1960s and the stones of the village, probably many taken from the ruins of Lachish, were sold to building contractors. Who knows but some ancient inscription was unknowing transferred from Lachish to Qubeibe and is now part of a wall in the area? I recall that Richard Whitaker was the one best able to converse in Arabic.